Having walked odd lengths of Hadrian’s Wall, the Antonine Wall, the Roman limes frontier in Hungary and Austria, and Offa’s Dyke, I leapt at the opportunity of walking the Great Wall of China. This May, following weeks of preparatory training walks, I joined a self-selecting and diverse party of 36 fellow volunteers at Heathrow for a non-stop flight to Beijing. On arrival in China’s capital, there was no messing about. We were bussed directly to the Wall base 50 miles north of Beijing, at Gubeikou. This was once one of the most important passes out of the Imperial realm to the north, sadly destroyed by the Japanese in 1937. As the mountains girdling Beijing to the north became ever higher, the first, unbelievable glimpse of the Great Wall appeared. Looking up, we saw shadowy towers crowning the jagged peaks of an arête of the Jundu mountains, the first mountain range. It was impossible to imagine how anyone could even get up there, let alone build a mighty frontier. Yet we would be spending the next five days, walking 50 miles through both restored and unrestored sections of the Wall, and camping overnight. We took a collective sharp intake of breath and set forth from Gubeikou walking east. Although we would be walking some sections of the Wall unknown to most, we would be seeing but a fraction of its entirety. The Wall runs from the coast at the Korean border, skirting west and south around the Mongolian desert over some 4,163 miles (6,700km). However, length estimates vary quite wildly depending on which walls you count, for there is not just one wall, there are many. They were built over centuries by various kingdoms and empires, with offshoots here and there (please see the box feature on pages 34 & 35 and the simplified map for more information). Some spots we passed had romantic names: the Peak of Happiness, Sky Bridge, Fairy’s Tower. And at times the route passed through forests of sumac, aspen and gingko, with a myriad of wild flowers, and we were welcomed through small subsistence-farming villages. We were generally trekking along a length known as the Guibeikou to Badaling section. Though beautiful it was challenging, for we walked through precipitous mountain country reaching up to 3000ft in places, with drops of 1000ft or more. This portion of the wall has been described as ‘perilous, dense, diverse ingenious and peculiar’ – and with the walkway occasionally reduced to no more than 40cm wide at the top, one has to watch one’s step. The wall we walked was largely reconstructed in the Ming period by General Qi Ji Guang around 1570 and much of it is happily unrestored, allowing details of its construction to be appreciated. Thus in places the walling, characteristically of brown brick facings on the inside on a heavy stone base, appears to have been originally limewashed. Some bricks also bear the imprint with the Emperor’s name – a welcome aid to dating. The wall is also notorious among visitors for its innumerable steps of irregular height – perhaps the single outstanding fact that anyone who has walked the wall bitterly remembers. Occasionally, stairs offered access to the wall top, while the front parapet is pierced with loops for the use of weapons, often angled down. I was slightly disappointed to find that the highest point on the route has now been closed. However, this has been deemed essential to protect it from growing erosion. Indeed sooner or later, China will need to take on the problem of the degradation of the archaeological resource caused by rapidly increasing tourism, and by the popularity of treks such as ours, not to mention the problems encountered in the recent past. The Great Wall endured much damage and degradation from robbing and modern development, especially in the period of the Proletarian Cultural Revolution, May 1966 to 1969, and in the following Gang of Four period that followed up to 1976. These were periods that condemned ‘Old Customs and Old Culture’ when any expression of concern with the past was strictly condemned as ‘ideologically incorrect’ and needed ruthlessly expunging. Despite this, the need for conservation and preservation of the wall had been expressed since the early 1950s. And in 1984, the Great Wall of China was recognised by Premier Deng Xiaoping as a national cultural symbol. Thereafter a programme of restoration was commenced. This work, although admirable in its breadth of achievement, involved extensive rebuilding, ignoring the more subtle and informative features which would in time have imparted a greater degree of understanding. The famous Badaling section – not far from Beijing and heavily visited by tourists – was declared a World Heritage monument by UNESCO in 1987. With its rebuilt towers and secure footways it is, to my mind, a massively sanitised version of the wall. In spite of the various vicissitudes of history and the ravages of weather, the Great Wall sections that we walked have survived remarkably well. This is largely due to its remoteness in barren and intractable country. Its future protection is helped by these same factors and the relative sparseness and poverty of the population, as much as by direct Governmental identification and legislation, although how much this will continue into the future in a world of tourism and the increasing wealth of the indigenous population cannot be forecast. There have been a number of important moves to afford it legal protection. 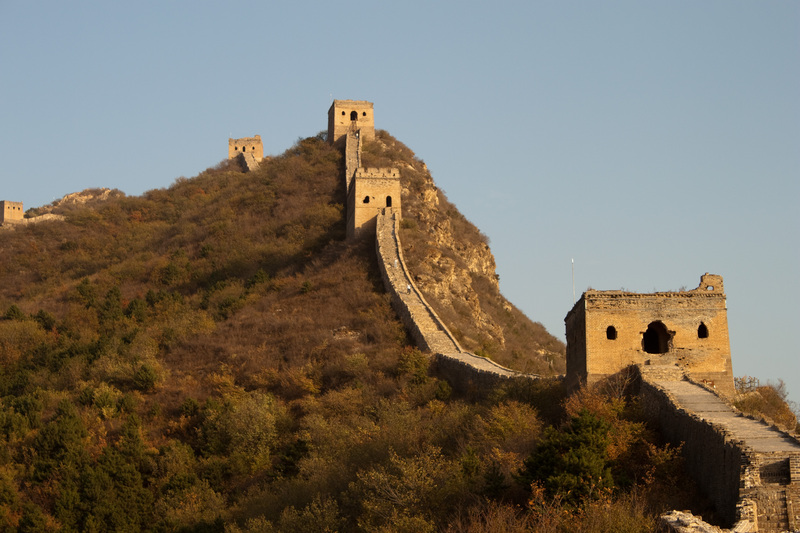 In 2003 Beijing Municipality signed up to a code for the protection of the Great Wall, under the 8th Standing Committee. Article 7 of this code requires a general field survey to be carried out, with appropriate signage for the wall’s better protection. The municipality has also set up a research centre for China’s world cultural heritage to engage with the more advanced theories and international standards. This is located in Beijing’s University of Technology. It has already had some success in enhancing the study of conservation technologies, including the renovation of historical sites in Beijing itself, under UNESCO’s guidance. One major deficiency is that there is as yet no provision for the protection of the setting of the wall in terms of its natural heritage, a tall order, but one that is, in world terms, essential, as it is the setting that offers the breathtaking grandeur which so impresses visitors. In more modest terms there are some bylaws of the Beijing Bureau of Cultural Relics which provide a buffer of 200m either side of the monument in which no development of any kind can take place. In 29th November 2006 a new law was passed ‘the World Heritage Protection and Management Law’, which seeks to clarify who is actually responsible for looking after the site, and to establish monitoring systems. Perhaps surprisingly for China, it makes provision for members of the public to become involved, through volunteer organisations, in monitoring the sites, and it provides for training and expert guidance. It remains to be seen if these make some impact on the enormous problems which the country is having. Various mishaps have happened and will probably continue to happen; farmers utilizing the structures, power lines, mobile phone masts, and most recently the demolition of a section of wall by a mineral extraction company to make a better access to its quarry. There are many misconceptions about the Wall of China.With a maximum width of 6m it is certainly not visible from the moon, nor even near space. Nor did the alleged one million victims of slave labour provide its footings. Nor is the mortar that binds together the bricks and stone made from ground human bone – although perhaps just as surprisingly, its major element is rice flour. But what is perhaps more relevant is that the Wall is not really a wall but many walls. Its lengthy history takes as many twists and turns as the wall itself. Let us start from the beginning and take a walk through time. What is called the Pre-First Wall, better termed the Chu-Qi wall was built 685-645 BC. This was reworked and extended in 461-409 BC when the Kingdom of Qin defended its southern border against the Jin peoples to the south. Neither of these count as the Great Wall, merely episodes of Iron Age peoples. Qin, however, pushed its borders north to keep out the Eastern Hu nomads, the constructions extended by the adjoining kingdom of Yan from the Yellow River into Liaoning province to the east, an accumulative total of 3,200km… nearly 2,000miles of walling. Yet these efforts pale into insignificance against the First Great Wall, ordered by the mighty Emperor Qin Shi of the unified Qin, the man after whom China is named. His wall snaked on for a further 5000km. It was completed in 214 BC, and took four years and the toils of 800,000 labourers under General Meng Tian. The full fledged wall of the newly unified China now extended to Pyongyang in Korea, and effectively kept the nomads at bay. As always, a wall, however effective, does not protect against internal dissent, and when the Qin were overthrown by the Han in 206 BC, the new Han emperor extended the wall to the west which, like the Maginot Line, had been evaded at the end by the Xiongnu nomads. It was now reaching its fullest extent, stretching from the southern borders of the Gobi desert in Inner Mongolia to Korea. However, a wall of this length is hard to man, and to maintain, and those northern nomads managed to breach the wall at several weakened points. This gave rise to an episode of rebuilding and further extending the wall in places, and reinforcing it with an outer line of adobe (mud) walls. This is now known as the Second Great Wall of the Han Dynasty. In the far west, outposts were built of rammed earth, and sections of wall built also with mud. The route between these outposts, called the Hexi corridor, eventually became the great trade route to the west, the Silk Road, the protection of trade giving the defences a new role. The Han wall itself amounted to a further 500km. In AD 446, due, once again, to problems of maintenance and tenacious enemies, the Wei kingdom built various walls to try and hold the problem. These ran parallel, sometimes outside, sometimes inside the Great Wall itself. A further 100,000 labourers were enlisted for this project. In 543 another inner wall was built to connect with the earlier one. After the fall of the Wei and Sui kingdoms, the new rulers, the Tang Dynasty from 618AD formulated a policy of engagement with the northern peoples, thus the wall changed from being a military defence to a customs barrier, so it remained for the next 400 years. In 1058 the Liao dynasty (replacing the Tang in 937) troubled by the Manchu peoples to the north, built a new defence wall further north – unsuccessfully as it was overwhelmed 59 years later. The Third Great Wall ‘of ditches’ was commenced by the Manchus themselves in 1148. Anticipating the Mongols, they built and reinforced the northern border, and built a new inner wall bounded by ditches to make it more difficult for the attackers. These now are subject to archaeological excavations. Despite the improvement to the frontier, the Mongols, under Kublai Khan, overran the border and established the Yuan dynasty in 1276. Being so strong and dominant, they had no need for the earlier walls, which were allowed to fall into rack and ruin. Thereafter, the Fourth Great Wall was the expression of the strength and power of the new Chinese dynasty – the Ming, who ruled China from 1368 to 1644. They started by establishing a frontier of fortresses, beacons and gates along the line of the earlier walls, with a second line of defence with eight garrisons set well behind the frontier, more or less like the Stanegate’s relation to Hadrian’s Wall, but on an unbelievably larger scale. At its extent, the total garrison strength is said to consist of one million men at arms, with conscripts and prisoners as labourers. It was not until 1449 that the need to reinforce the great wall was appreciated after a serious defeat in the hands of the old foe, the Mongols. The work of General Qi Jiguang over 1569-1583 is now what remains in the popular imagination as THE Great Wall. Their wall consists of an external stone face and internal brick facing, both battered and crowned by parapets front and back, leaving a 4.5m wide wall walkway along the top, which was used for communications. The core is solid, composed of lightly mortared clay and rubble.Wherever possible, the wall follows the highest point of the mountain ridge with towers positioned not at given intervals, but at strategic points selected on site. Many towers are two, three or even four stories high, in response to their siting. A few towers acted as regional control points, as they are significantly larger and can act as storehouses. On the top of the towers, there is often a small building with a pitched roof which sheltered the garrison watch. Access to the wall top is usually by inset or external stairs at infrequent intervals, set within the width of the wall. Supply buildings and grain stores, round or rectangular, are dotted around. These were often defensible in their own right by a small holding squad. Troop bases, called ‘barrack castles’ were also located in nearby towns and villages, recognisable by their adobe walls, some in more remote areas giving rise to later settlements, again like Hadrian’s forts in remote locations. These are the sort of historic buildings currently at most risk, but are essential to understanding the workings of the Great Wall of China. To my mind, a comprehensive survey is desperately needed.